I had never been to Iceland before – although I had thought about it. So when I had the opportunity to visit with Saga Cruises, I jumped at the chance. The 15-night sailing was aptly titled ‘Land of Ice and Fire’, and we were to sail from the port of Dover to Orkney, Iceland, Belfast and Liverpool. Although our UK ports each offered wonderful experiences ashore, I want to highlight our five days and four ports in Iceland, as it was magnificent – and unlike anywhere else that I have ever had the pleasure of visiting. 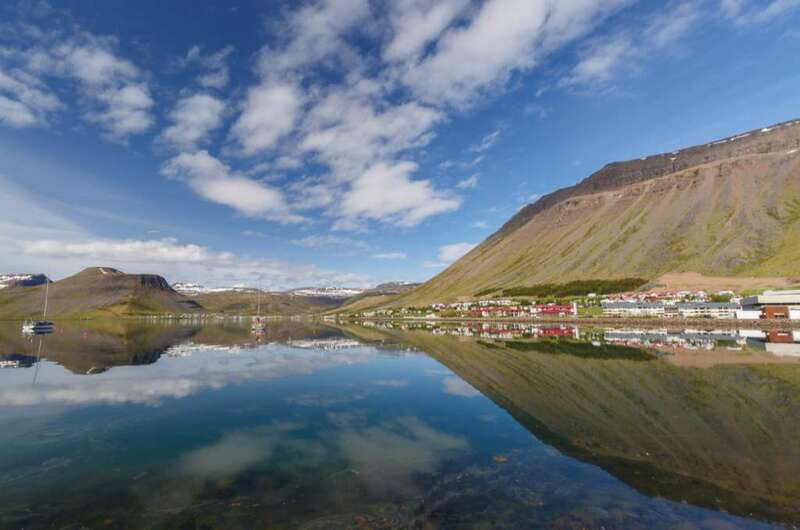 Our first port of call was Seydisfjordur. On the morning of our arrival, I opened the door and was greeted by beautiful snow-capped mountains, cascading waterfalls and warm air temperatures. Saga Sapphire began her stay here at anchor, so I boarded the tender boat and headed ashore for some exploring on my own. It’s not a very big place – you can easily see the best bits in under two hours – but I managed to explore every nook and cranny. Five hours would go by before I made my way back to the ship. I walked right around the town and then made my way towards the beautiful waterfall that I’d seen from the aft deck of Saga Sapphire. What a sight it was! I was completely in awe and just stood looking at it for a good 20 minutes. The sound was incredible and the water jumped down the mountain as if it were flowing to freedom. Eventually, I left the waterfall behind and then walked for a short time through the little valley – but I didn’t manage to get too far before I had to turn back. The greenery was a little too thick for me to trek through with exposed ankles. Regardless though, it had been a very pleasant walk. We would be berthed overnight in Akureyri, which meant two days of fun and adventure. For day one, I had booked a whale-watching excursion. Although it was an incredibly damp and cold day, it would offer one of the biggest highlights of the entire cruise. We walked from the ship to the boat and, once onboard, most people made their way inside. I didn’t. I braved Mother Nature as, after all, we were there to spot whales and how can you do that unless you’re outside looking for them? The crew on board offered us warm, waterproof suits to wear. I’m so glad they did because without mine I’d not have been able to stay outside. Within just a few minutes of leaving the dock, we came across a humpback whale. It was incredibly close and it felt quite surreal. Several times, these wonderful creatures of the deep were so close to the boat that we could almost reach out and touch them. As the tour came to an end, we were offered a gift like no other. One huge Humpback breached three times and I managed to capture one moment on camera. It was magical and a moment that I will certainly never forget. Day two in Akureyri also started cold and wet, but I threw on my waterproofs and off I went on the ‘Jewels of the North’ excursion. Our first stop was Godafoss (Waterfall of the Gods). I thought the waterfall I’d seen in Seydisfjordur was impressive, but this was something else entirely. 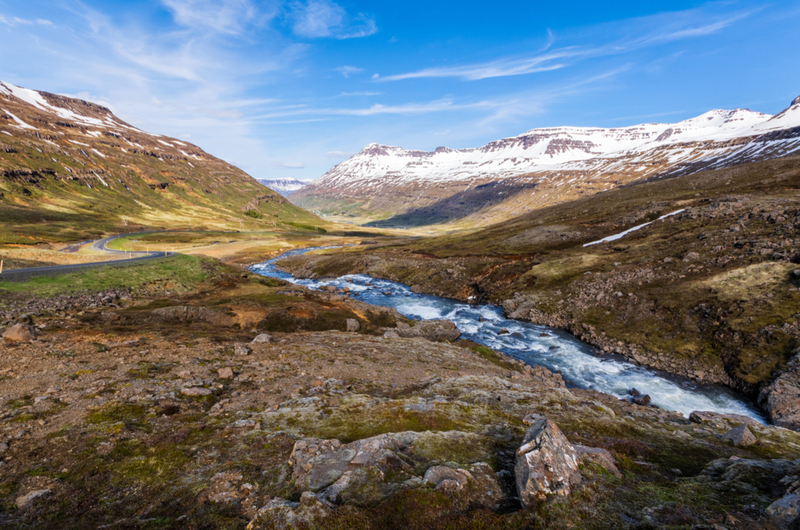 The crescent of cascading water was named when Thorgeir, law speaker of the Old Icelandic Parliament, threw images of the Norse Gods into the water in 1000 AD to show that Iceland would thenceforth follow the Christian religion. We spent a short time at Godafoss before moving on to Lake Myvtan, where we explored some of the ‘pseudo-craters’ at Skutustadir. It was very old and very windy and we really didn’t have enough time to explore the area in depth. What I did see was impressive, but if I return to Akureyri, I’ll go back to this site. Next it was off to Dimmuborgir for more stunning scenery and surreal formations from past volcanic eruptions. It reminded me a lot of the volcanic fields in Lanzarote; it was just much colder! Again, we didn’t see much of the site, but I didn’t leave feeling I’d missed out as our guide made sure we got to see the best bits (and I guess once you’ve seen one volcanic rock formation, you’ve seen them all). However, I did see one formation that looked like a troll; that was quite cool. Our most impressive stop of the day was at the geothermal field at the foot of Namafjall Mountain. I’d never seen anything like it before and I was fascinated by the landscape. I’d gone from a volcanic lava field to what looked like the desert – all in less than 60 minutes! The steam coming from the water was warm and it briefly took the chill out of the air, but the smell of sulphur was quite overwhelming. If you’ve never smelt sulphur before, it’s like the smell of rotten eggs; it’s utterly disgusting. There were mud pots, steam vents, boiling springs and fumaroles. It was a great way to end what had been a fascinating and very busy day. I had originally planned to explore this small town on my own, but I decided instead to book the short tour that took in some of the culture, so I felt I could leave having learned something about what I was looking at. The tour provided us with yet another stunning waterfall, but this time we wouldn’t just admire it, we would also drink from it (I know; very cool). The water was so pure and very refreshing. We also stopped at the Osvor Museum, where quaint buildings that were restored in 1988 reflect the life of the fishermen from the early days up until the 20th century. It was very interesting. They certainly had an incredibly hard life. I had booked ‘The Golden Circle’ tour here. I did consider the Blue Lagoon, but I was still craving more scenery. The coach left the port and we made our way to our first stop: Thingvellier National Park, which is a UNESCO World Heritage Site. The entire area is carpeted with moss and surrounded by mountains; it’s very beautiful and there are photo opportunities at every turn. We didn’t walk around the entire park (it’s quite vast), but once back on the coach we did drive through a larger section as we made our way towards our next stop, which was Geysir. 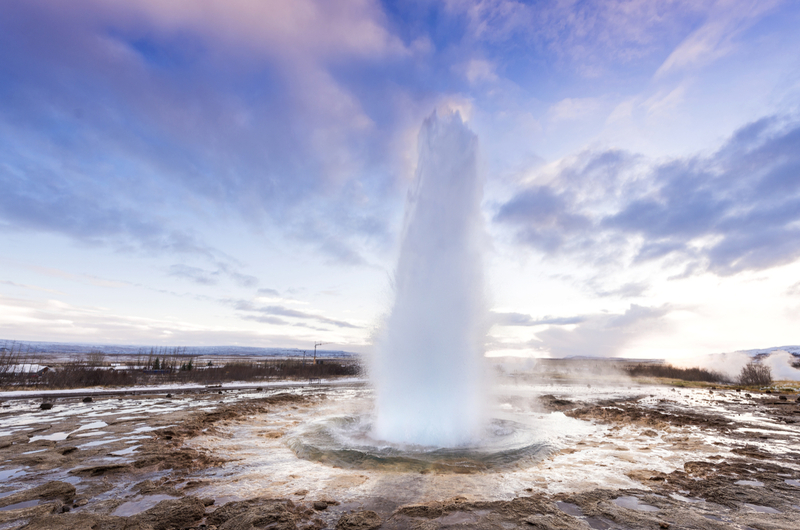 Geysir is home to Geysir Strokkur, which spurts water high into the sky every few minutes. The water is between 80 and 100 Degrees Celsius and I can confirm for you that it is very warm because I got soaked to my skin from one spurt, which shot at least 40 feet into the air. Our guide told us not to get too close, as we would then risk a drenching, but I decided I’d get as close as the small rope fence allowed. I was soggy for a while, but I’d do it again in a heartbeat. You could tell when Geysir Strokkur was about to blow because a light blue bubble (almost like a shimmering glass eye) would suddenly rise to the surface and then the water would erupt into the air. It was fascinating to watch; I’d never seen anything like it before. There are smaller pools of water along the path and they too bubble and boil, but not quite like Geysir Strokkur does. I was in complete awe of the entire area. I still can’t quite understand how one area can be a natural furnace with a desert-like landscape and then – just a few yards away – there’s brown soil and green grass. It’s magical. We left Geysir behind and made our way to Gullfoss. This magnificent waterfall plunges down a series of cascades before reaching a deep gorge in the Hvita River. As well as being one of Iceland’s most visited landmarks, it has a very interesting story to tell. 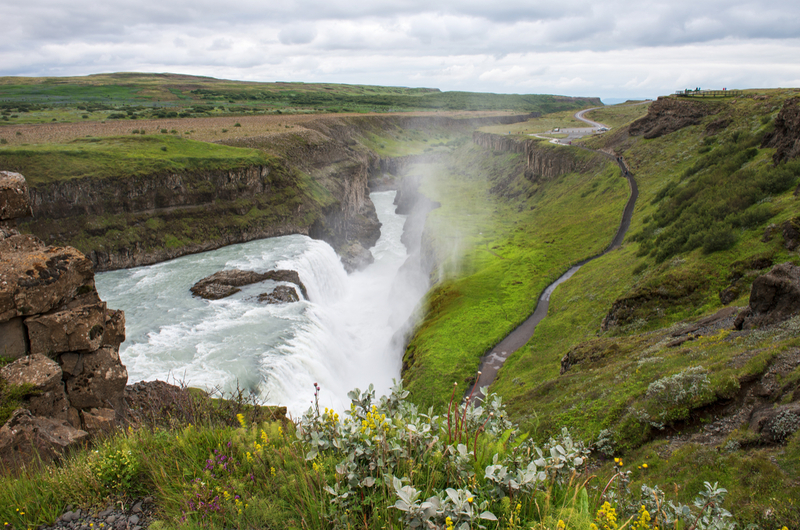 Foreign investors wanted to harness the power of Gulfoss, back in the early 20th century, to produce electricity. All offers were declined until the owner, Tómas Tómasson, leased the area to an Englishman named Howells. Tómas’ daughter, Sigriður Tómasdóttir, sought to have the contract voided and for years they battled it out in a Reykjavik court. Her attempts all failed, but the contract ceased anyway due to lack of rent payments on the waterfall from Howells. Because of her attempts to preserve the waterfall, Sigriður is often referred to as Iceland’s first-ever environmentalist. 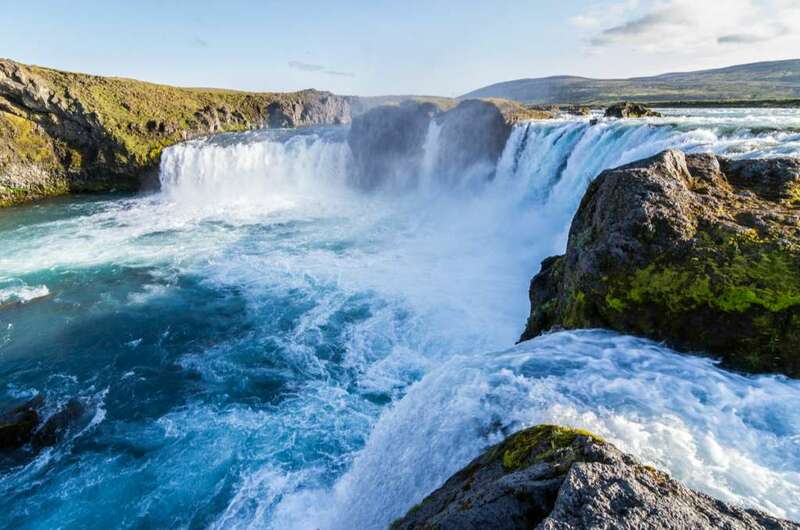 The waterfall was later sold to the Icelandic government and designated a nature reserve in 1979. Our tour ended with a drive over the moors of Hellisheidi and a stop at the Perlan in the heart of Reykjavik, which offers fabulous views across the city. I’ve sailed with Saga several times and they have the concept of ocean travel down to a fine art. They remember that one sails to be close to the sea and explore new lands. The ocean aspect is a key factor in why so many of us choose to cruise and that, mixed with superb culinary choices, spacious and tasteful accommodation options and a crew that is second to none, makes for a truly wonderful cruise experience. Icelandic Discovery – 16 nights, departing 12 July 2018. Norway and Iceland Exploration – 16 nights, departing 16 September 2018.